Don DeLillo was born on November 20, 1936. To celebrate his 81st birthday, Katherine Da Cunha Lewin reflects on his engagement with 21st century issues throughout his writings. ‘Will there still be the lone individual seated in a room trying to create a narrative that is equal to the advancing realities of the world around us? It may be that the fragile state of the planet will summon a new kind of novel with a language that alters our perceptions. Great novels reveal consciousness. But a final question lingers, beyond the man or woman seated at the writer’s desk. In these lines we see the author wrestling with the central questions in the 21st century, as climate change and technological advances loom over the creative individual and alter the possibility for thinking and writing. His beloved modernist room, that metonymic space for the writing process, cannot exist in the same way now that humanity is exposed to, and aware of, new threats. These lines speak of a writer whose idea of writing is borne out of its contexts; writing cannot shy away from the world, but must prove ‘equal to … advancing realities’. DeLillo’s writing from the 21st century—Cosmopolis (2001), The Body Artist (2003), Falling Man (2007), Point Omega (2010) and Zero K (2016)—have undoubtedly engaged with a myriad of issues, from technology, terrorism, war, and climate change. In his last novel, Zero K, he went another step further, not only collapsing many of these issues into a wider worry about the problem of death, but also speculating on the facilitation of consciousness that might go beyond the confines of the human. In the central section of the novel, entitled ‘Artis Martineau’, DeLillo imagines consciousness in suspension, literally: abstracted from space and time, the consciousness of Artis who is contained in a cryogenic chamber, tries to parse her own thought process as it occurs. Artis thinks, but the direction of her thoughts are difficult to make out and, devoid of a sense of time and space, cannot be self-reflexive. Ultimately, as much of DeLillo’s fiction exposes, consciousness is deeply intertwined with the making of language: ‘Am I someone or is it just the words themselves that make me think I’m someone’. Here we see DeLillo grappling with the last question he poses above; as technology transforms the scope of life, it also exposes the necessity for an ‘I’, a point of origin from which language is produced. In our collection of essays, we give a picture of DeLillo studies in the 21st century. 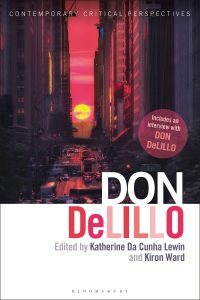 We cover the entirety of his oeuvre, including early short stories and plays, in order to demonstrate DeLillo’s penetrating perspective of America and his vital contribution to writing. We showcase the wide variety of work currently being undertaken in DeLillo studies: while, for example Professor Maria Lauret considers DeLillo’s fiction in the context of his Italian heritage, looking to his use of language in unpublished material and 1997’s seminal text Underworld, Dr Catherine Gander considers DeLillo’s engagement with quantum physics and temporality in Point Omega. 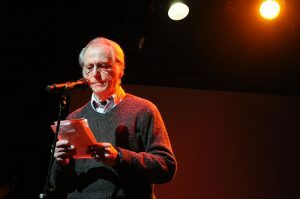 In his penetrating response to Zero K, in which he considers art, religion and intertextuality, Professor David Cowart reminds us how timely DeLillo is in the 21st Century. Our collection articulates how necessary DeLillo’s thinking and writing proves in tumultuous times. Katherine Da Cunha Lewin is a tutor in American Studies at the University of Sussex, UK, where she received her PhD in 2017. Her research reads the work of Don DeLillo and J. M. Coetzee together as a means of exploring interiority and interior spaces in the novel. She recently completed a biographic entry on Don DeLillo for the Dictionary of Literary Biography: Twenty-First-Century Novelists (2018). She is co-editor, with Kiron Ward of the volume Don DeLillo: Contemporary Critical Perspectives, now available from Bloomsbury.